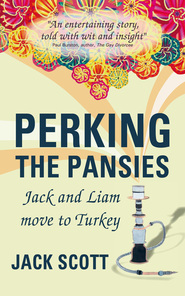 This is Jack’s début book and, as the title suggests, it’s an autobiographical account of Jack and his civil partner Liam’s move to Turkey. Bored with a life of suburban humdrum, stressful jobs, and a comfortably secure but passionately dissatisfying life, they decide on a new start in Turkey. And so their journey begins. As expat stories go, this might seem straightforward enough – until you remember that Jack and Liam are openly gay and that Turkish society is overwhelmingly Muslim and can be very conservative and conventional. A disaster waiting to happen? Well, I’m not going to spoil the story for you. But it certainly does add a certain frisson to the narrative. The book is quite a page-turner. Jack is an expert people-watcher, and much of what makes this book enjoyable is his wry, witty and sometimes downright scathing observations of others. We all know the type of expats who huddle together in groups, with no interests other than reinforcing their superiority over the locals, slagging off their new country, bemoaning what’s become of their old one, and attending regular expat meetings. I’ve heard the type referred to before as [insert name of local British group here]-types. Jack refers to them as “emigreys”. Brilliant! From grasping expats wanting to profit from other expats, to strange neighbours, to the self-superior and Blighty-hating emigreys, no one escapes Jack’s analysis and description. Of course there are some very fine people too – among the locals, the expats, and the family and friends Jack and Liam left behind in the UK. And it’s not all laughs. In one or two places the mood turns very dark indeed. In others, there’s a sprinkling of pathos – some of it sad, some of it heartwarming. This adds balance and depth to what might otherwise be just a catalogue of accurately observed, witty and acerbic pen pictures. It’s a good account of the light and shade of an off-the-wall expat lifestyle, told in a fast-paced and highly amusing way. If you’d like to read it – and I recommend you do – it’s available from Amazon and other good bookshops. Amazon also sell a Kindle version. Win a free copy of Perking the Pansies ! Would you like to win a Kindle version? Here’s what to do. Simply comment on this review and say why you would like to win a free copy. The closing date for entries is 2359 GMT on Thursday 7 June 2012. After that, Jack will come along and choose one lucky winner according to what he thinks is the best comment. This entry was posted	on Monday 7 May 2012 at 12:56	and is filed under Book Reviews, Turkey. You can follow any responses to this entry through the RSS 2.0 feed. You can leave a response, or trackback from your own site. What a stunning review. Thank you. I’m so glad you liked the book and hope the lucky winner does too. Cheers! An excellent review of a great book! I’ve read it in paperback, but a Kindle copy would come in very handy for my holidays. After all, Perking the Pansies really deserves to be read on a sunny beach. Why would I like a Kindle copy of your book? Simple! 1. I, too, live in Turkey, and so know how hard/expensive it is to get a good, real, live book. Thus my Kindle which has saved my (reading/fantasy/escape) life. 2. I have many pansy friends. Despite my best efforts, many of them think they can’t visit Turkey because it will be too unwelcoming. It would be nice to be able to present them with a balanced view via your story. Looking forward to reading your book, one way or another! Spot on review of this great book! Loved this book, never laughed so much! A kindle copy would be great to be able to share this super book with my guests when they come for a visit. Spot on review. Perfectly describes the book. I have been a follower of Jack’s blog and enjoyed the book even more. A kindle version would be the perfect way to remind myself of their adventures when travelling and have no access to wifi. I’d hate to suffer withdrawal symptoms for Jack’s blog so being able to re-read the book anywhere is a must. It beats one of those bibles they sneak into your hotel room! Their adventures have as much human experience and every emotion the world can throw at you but without the genocide! A must for anyone who travels, in fact a must for anyone! After reading the sample on kindle I can’t wait to read the full version!! Having met Jack may I say that the sample felt like sitting in one of our favourite bars talking about life here. Turkey really is a dichotomy of a culture – always full of surprises. I love living here. You meet all kinds of people and Jack’s observations are always spot on – sometimes too spot on!! A fabulous summer read giving an insight into expat life in Turkey and a more importantly an inspiration to those who want to do something new in their life! I’m a huge fan of Jack’s blog however sadly, being a cheapskate, I still haven’t bought his book as I keep hoping to win a free copy! A Kindle copy would be a brilliant early birthday present and I promise faithfully to read it on the train to Bruges (where I will be celebrating my 65th) and of course to leave a glowing review on Amazon on my way back to Spain. Why do I want to read it? Because I would like to know whether we would have enjoyed being expats in Turkey, if we hadn’t been tempted to retire to Jumilla in Spain by its excellent red wines. Salud, Jack! I would love to read this book! I’m a fellow traveler/blogger and intense people-watcher! I also love to record my scathing thoughts about the people I encounter during my travels. I’d also be interesting in reading about the struggles of being gay in Turkey. enjoyed the review, and the perking the pansies blog. i would like a copy of the book in kindle version because although i am not gay, i am willing to help out if they are short handed. This review makes me want to put my feet up on the balcony with a nice glass of wine and lose myself in someone elses life for a while. I accidently came across Jack’s blog today and of the small amount I’ve had time to read have found it rather entertaining. I have lived in Antalya for the past 11 years after falling in love with Turkey on my first visit to Bodrum. I would love the chance to win this book as like others have said it is hard to find a good and entertaining read here and also I am interested to see Turkey through another expats eyes. An excellent review, Kay. It sent me straight to Jack’s blog to learn a bit about the author, and to listen to the samples of Liam’s music. Pity I don’t plan to visit Turkey in the near future – I’d love to chat to Jack & Liam – and not on retired colonial ‘When I’ themes. Liam and I put the names into a bowl and picked one at random. The lucky winner is Mick Sutton. Now all I need is Mick’s email address to send the Kindle file to.